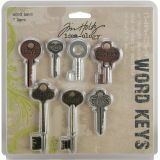 Idea-Ology Word Keys 1.5" To 3" 7/Pkg - ADVANTUS-Tim Holtz Idea-Ology Word Keys. Perfect for scrapbooking along with other crafts. This package includes seven keys stamped with inspiration words in an antique finish ranging in size from 1-1/2in to 3in (three nickel, two brass and two copper). Imported.